The Nanostone ceramic UF membranes were used to help with the wastewater treatment process. With regulations requiring industrial refineries to reuse wastewater and in some cases meet zero liquid discharge standards, the wastewater treatment system requires additional process steps to be taken. Ultrafiltration (UF) and reverse osmosis (RO) technologies can help with this. Whether your wastewater comes from coal gasification, oil refining, or other chemical refining, one thing remains clear: you need a robust ultrafiltration membrane that you can rely on. If your UF membrane fails, your ability to meet your reuse requirements is at risk. Traditionally, polymeric ultrafilter (PUF) membranes have been used as pretreatment to RO in industrial wastewater reuse systems. The wastewater stream is often highly variable; multiple waste sources cause big upsets with the biological or chemical clarification process. PUF membranes in this case are unreliable with fouling, fibers breaking, frequent cleaning and shorter lifetime. Upsets and unplanned downtime cause increased operational costs, reduced production, and potential discharge violations. Testing on Nanostone’s CM-151TM ceramic membrane has shown their ceramic UF has a higher suspended solids limit, lower fouling potential and the ability to recover with chemical cleaning without reduction in membrane life. The ceramic membrane technology is a more robust, reliable, and easy to operate option when compared to PUF membrane systems. A chemical refinery plant located in Qinghai, China operated a non-biological wastewater treatment plant with chemical precipitation followed by clarification, conventional media filtration, and finally, with reverse osmosis (RO). The wastewater was reused in the plant's cooling tower. The conventional filtration system did not adequately pretreat the water before the RO membranes and the system was unreliable with frequent cleaning and short RO membrane life. They needed to upgrade it to reduce their operating risk and expense. The owner, working with the engineering and an equipment company, decided that ultrafiltration (UF) was the best solution to fix the problem. The end user wanted a more reliable and robust solution than regular polymeric UF membranes and they selected Nanostone ceramic UF membranes for the project upgrades. In November 2016, the Nanostone ceramic UF system was commissioned to pretreat the RO system. To date, the system operation is excellent with the ceramic UF net ﬂux rates between 130 and 170 liters per hour per square meter (LMH). The Nanostone ceramic UF has an overall recovery of >95% and an average transmembrane pressure (TMP) of < 1Bar. The system uses a daily chemically enhanced backwash (CEB) and the recovery cleaning frequency is greater than 30 days. 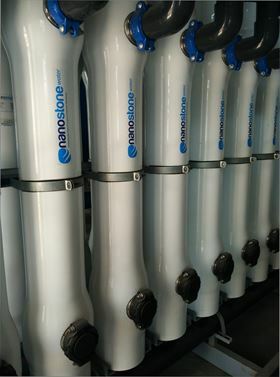 The Nanostone ceramic UF produces water to feed the RO with low silt density index and turbidity well below the limits for RO feed water quality. The ceramic UF modules are installed in a state of the art fully automated UF system. With the superior water quality now feeding the RO membranes, overall, the wastewater reuse system is much more stable and reliable. The operator also has more confidence in the more robust ceramic UF membranes so they can rest assured that the system will perform well into the future. US manufacturer of ceramic ultrafiltration membranes, Nanostone Water, has announced the launch of its next generation membrane product, the CM-151. Clement will lead Nanostone Water’s international business expansion. Ceramic membrane company Nanostone Water has added polymeric MF/UF/NF and RO technologies to its portfolio with the acquisition of Ultura.